Camellia sasanqua ‘Narunigata’ a member of the Theaceae family, that can be found by the bandstand. 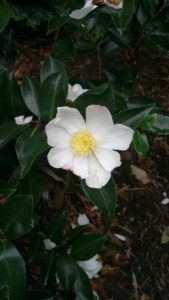 Camellia sasanquas are winter and spring flowering plants. This cultivar C. sasanqua ‘Narunigata’ has solitary, fragrant, creamy white flowers that can be edged in pink and are about 50mm across. It is one of the more reliable forms not needing a baking summer to encourage flowering. It is an evergreen shrub, with dark green glossy leaves. It has an upright habit that can reach to 4metres by 2.5 metres in 10 years. It should be planted in some shade away from early morning sun that can damage the flowers. As with all Camellias it prefers an acidic soil. It will not require pruning unless it grows out of it allotted space, in which case prune after flowering.